Whether you are a seasoned web developer or signing into Google Analytics for the first time, having a basic understanding of your website traffic data is imperative to making well-educated site improvements. There are three main sources your web traffic can come from. Direct Traffic comes from users that typed your URL into their browser or used a bookmark saved in their browser. Referral Traffic is from inbound links to your site. For example, if myawesomeblog.com has a link to yourawesomeMSP.com and a visitor clicks on that link, myawesomeblog.com will be listed as a referring site in your analytics data. Search Engine Traffic is calculated as the number of visitors that arrive at your site via Google, Bing, Yahoo or any other search engine. Google Analytics also tracks which keywords were used to find your site. The Content menu of Google Analytics allows you to see which pages visitors are viewing and how they move throughout your site. Top Content lists the pages in your site that have the most pageviews. In most cases, your top page will be your homepage which appears as "/" in Google Analytics. The Landing Pages overview lists data on the pages through which visitors enter your site. Again, this will usually be your homepage, but this also allows you see how advertising or event landing pages are performing. Goals are a convenient way to track the completion of an activity on your website. We automatically include two destination URL goals when setting up your analytics. First is the Contact Us Page Goal. This records a conversion each time someone visits your Contact Us page. Second is the Thank You Page Goal. This records a goal completion when a visitor submits one of the forms on your site and arrives at the Thank You Page linked to the form. Goals can also be set up to track time on site and number of page views. Google Analytics is a powerful and sometimes overwhelming tool. 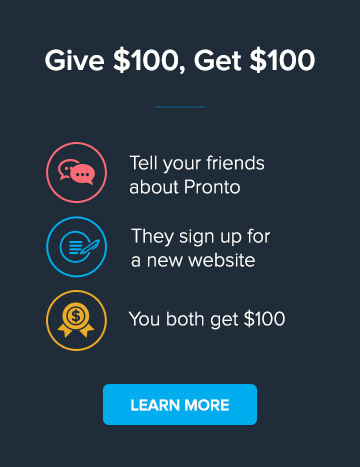 If you ever have any analytics questions, feel free to send a ticket to support@prontomarketing.com. If you currently don’t have access to your Google Analytics account, please send us your Google Account username and we will add you as an administrative user.